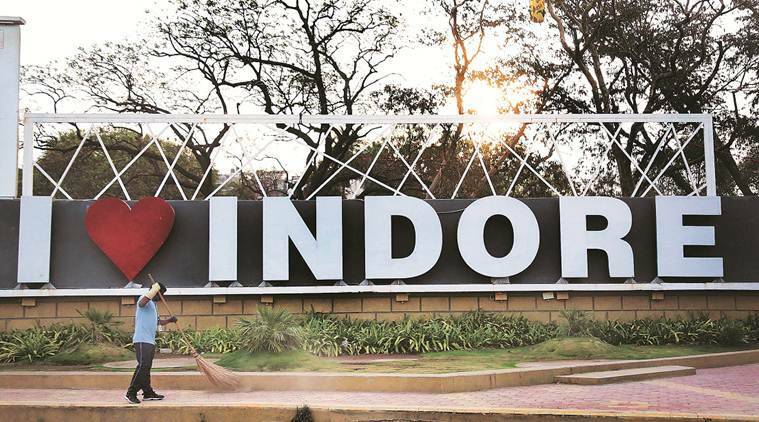 Over 600 city corporations have visited Indore to learn how a city, which ranked 25 in the 2016 cleanliness survey, has managed to consistently top the charts since then. From over 700 new toilets and urinals to 3,000 roadside bins and a live tracking system to monitor garbage vans, Indore did a lot of things right. Every time the green-yellow garbage van approaches the Anuradha Nagar slums on the outskirts of Indore, 10-year-old Jeetu Goswami runs through the narrow lanes, a half-broken bucket and a tub in his hands. “Sukha kachra isme hai (Dry waste is here),” he says, pointing to the bucket. Starting 7 am every day, Bollywood singer Shaan’s voice booms through the van’s loudspeaker — ‘Indore hua hai number one, Indore rahega number one’ — as ragpickers in the slum empty their buckets in the truck’s separate compartments for wet and dry waste. “Earlier I used to throw it in the drain. Now someone wants to clean even a ragpicker’s house,” says Bablu Giri, pointing to his prized investment — two dustbins worth Rs 50 each. In 2019, Indore struck a hat-trick for the cleanest city under the Swachh Bharat Mission (SBM). For Indore Municipal Corporation’s (IMC) zonal in-charge Monesh Gawade, nothing illustrates the success better than the change in attitude of the slum and its children. “If their parents are not around, these children come to throw dry and wet waste,” he says. In three years, the city has switched to total door-to-door segregated waste collection, and the 1,150 metric ton of waste that the city generates every day is fully treated. Every night, vacuum cleaners polish the roads. Even automobile showrooms offer a tiny dustbin to customers buying cars. But the highlight remains the clearing of the 148-acre Devguradiya dumping ground on the outskirts of the city. In its place stands a much smaller, scientific landfill that holds about 5per cent of the total dry waste that can’t be further processed. From across the country, 600 city corporations have visited Indore to learn how the Tier-II city has transformed. And more importantly, how its population of 25 lakh has changed to keep the city clean. Till recently, Madhya Pradesh’s SBM director Manish Singh was not sure if the cleanliness campaign could be sustained. “Now people have taken over the mission,” he says. A 2009-batch IAS officer, Singh was the Municipal Commissioner in 2016 when Indore ranked an “embarrassing” 25th among 73 clean cities. “After that, we wanted to do something. It all started then,” the officer says. Earlier, much of the waste generated daily would end up in open drains or the Devguradiya landfill, depending on where private garbage collectors dumped it. The IMC took over the door-to-door garbage collection in 2016, launching a pilot through Basix Municipal Waste Ventures, a Hyderabad-based firm that conducts programmes on solid waste management. “Kachre se pyaar hai ab (We now love waste),” quips Srigopal Jagtap, Assistant Vice President at Basix Municipal Waste Ventures, who has handheld Indore through its solid waste management project. Besides the private garbage collectors, the IMC had a few tricycles to collect waste, but these barely covered 150 houses a day. Under the new project, they were replaced by 800 vans, each covering about 1,000 houses a day. Initially, when these IMC vans travelled door-to-door, not many residents stepped out of their homes to dispose of garbage. Municipal authorities say convincing people proved easier in lower- and middle-income societies than in posh residential areas. Pramila Moharana, 34, who moved to Indore’s Silicon City from Chennai three years ago, was baffled by the insistence of garbage collectors in IMC vans to segregate waste. “When I didn’t do it, they refused to take my garbage,” she says. The garbage lay outside her house for days. She relented only when her four-year-old daughter Araadhya suddenly started searching for dustbins. She was taught in school, as part of mandatory counselling, about wet and dry waste. “If I threw something on the road, she would stop me,” she says. Eventually, Moharana bought an extra dustbin to throw vegetable peels and leftover food. The first resistance to the waste disposal plan, however, came from unexpected quarters — the local garbage collectors or ‘jagirs’ and the ragpickers. The new waste collection mechanism disrupted the jagir system, where a private garbage collector had a monopoly over an area. When the IMC started collecting waste, these garbage collectors went out of business. Protests were held for weeks. In 2016, when 3,000 dustbins were installed at every 500 metres at a cost of Rs 2.3 crore, at least 1,200 ragpickers lost their job. Eventually, the IMC absorbed 1,000 garbage collectors and most of the ragpickers, adding them to the force of 8,000 new ‘Safai Mitras’ who were tasked with collecting and transporting waste. With the introduction of a proper waste collection mechanism, the ball had just started rolling. “We knew waste management could work only if door-to-door segregation took place,” says Jagtap, who set up a 400-strong team for this task at Basix. The team would visit each house and demonstrate how to segregate waste. Dilshad Khan, who is in charge of multiple municipal zones, would often dress up like Mahatma Gandhi, hop onto buses and talk to people about how illnesses can be prevented with cleanliness. “Innovative techniques work. For instance, the Swachh Bharat song by the municipal corporation was an instant hit,” he says. Once segregated waste started coming in, its disposal became a challenge. Funds were taken from the Smart Cities Mission, SBM and IMC’s property tax kitty to construct 10 transfer stations, each costing Rs 4 crore, to collect waste before it was transported to the dumping ground. In the last three years, under SBM, Indore has spent Rs 408.74 crore. Keeping the station clean is an unspoken instruction. The compressed waste is later loaded onto a truck — separate ones for dry and wet waste — and transported to Devguradiya, Indore’s only dumping ground. Located on the fringes of the city, the 148-acre dumping area was once a massive garbage hill that witnessed frequent fires. It took the IMC a year-and-a-half to clean Devguradiya. “For a five-star rating in Swachh Bharat, one of the criteria is that 75 per cent of the waste be treated at the dumping site,” says Asheesh Singh, who took over as Indore’s municipal commissioner in May 2018. A fiscal plan worth Rs 65 crore was drawn up to first clear the ground. Singh then hired 12 specialised machines to clear the waste. That did the trick. Until May 2018, only 2 lakh metric ton was cleared. However, over the next six months, the entire 13 lakh metric ton was wiped clean at a cost of Rs 8 crore. “We focussed on two techniques, biomining and bioremediation,” Singh says, talking of how the waste was cleared. Through biomining, the machines first separated soil from recyclable items in the dumping ground. The extracted polythene was sent to cement plants, cloth for road construction, plastic and glass to the recycling unit. Bioremediation was used to further break down the soil. While the wet waste is entirely converted into compost and sold at Rs 2 per kg by the IMC, a new treatment plant set up in 2016 at Devguradiya tackles dry waste. Rajasthan native Reena Suryavanshi, 22, has been visiting the waste treatment site in Devguradiya every day to sort out plastic wrappers. She would earlier walk on the mountain of garbage looking for plastic mixed in a pile of sanitary napkins, glass and kitchen waste. “Without boots, my skin would catch infections,” she says. Now she sits cross-legged in a heap of compressed dry waste, stretching her hand out to grab plastic as other women segregate glass, shoes and other objects that have wound their way to the dump. Sharda Gaikwad, 27, bathes every time she leaves for work now. Until three years ago, she would simply wrap a dupatta around her face before visiting the Devguradiya ground where her entire family worked, looking for plastic. “Everyone working at the dumping site would smell. So I never bothered to bathe,” she says. In 2016, when bins were installed across Indore, she protested along with other ragpickers. Soon, the IMC offered her the job of working in a municipal garden. “I felt ashamed about meeting officers in my unwashed clothes. That is when I started staying cleaner,” she says, dressed in a fitted salwar kameez. Rs 100 a day to Rs 6,000 a month, Gaikwad now hopes to educate her seven-year-old. “All members of our family were ragpickers. But look how I have transformed,” she says. The IMC has set up compost pits in 585 municipal gardens and employed ragpickers for the job. Since January, a private firm has been utilising the plastic waste to create crude oil, petrol and diesel. From eight tons of plastic, 3,200 litres of crude oil is generated. “It’s in pilot stage. We have to see if the diesel can be used in vehicles,” plant in-charge Ram Gupta says. Recently, Mumbai Additional Municipal Commissioner visited Indore to understand how the city has achieved this “miraculous feat”. “Mumbai is stuck on clearing trenching ground to create more space. They need to learn waste segregation,” says an IMC official. Indore now hopes to reduce wet waste generation by creating small compost plants in homes. Already 30,000 families have started doing it. E-waste management is next. When Indore sleeps, Harvir Ahirwar wakes up to wipe the roads clean. As the traffic thins, armed with a hosepipe attached to a minivan, Ahirwar, 22, wears his gloves and mask. It is 11.30 pm. At Deendayal Upadhyay square, the bespectacled statue of the leader in front of him, Ahirwar aims the pipe, signals to his co-worker, and a jet of high-pressure water gushes out, splashing on the statue’s face. “When a visitor comes, they marvel at the city’s cleanliness. I know I have contributed,” Ahirwar says, who earlier worked at a shoe store. Every night from 10 pm till 4.30 am, roads, dividers, railings and 15 statues are washed using 10 hose pipe-equipped vans and 15 road-sweeping machines. 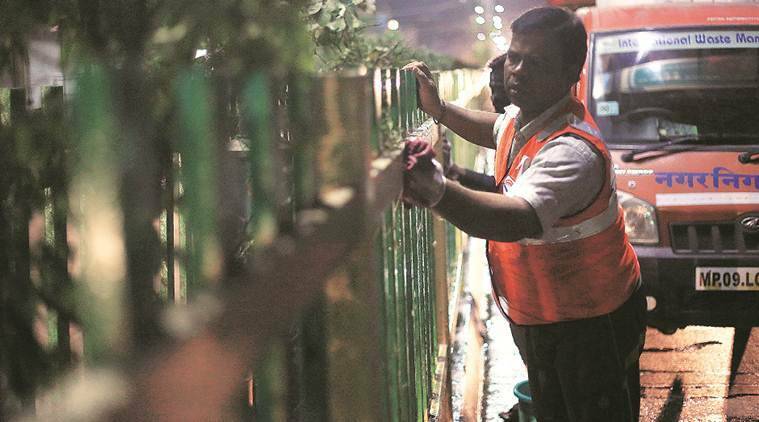 A few kilometres away, with a bucket full of soapy water by his side, driver-turned-cleaner Pravin Baretha, 26, is scrubbing a divider. “Tobacco stains are the toughest,” he says. While the permissible limit for Respirable Suspended Particulate Matter is 60 microgram per cubic metre, in 2016, it stood at 79 in Indore. Making the city dust free was, therefore, one of the objectives. 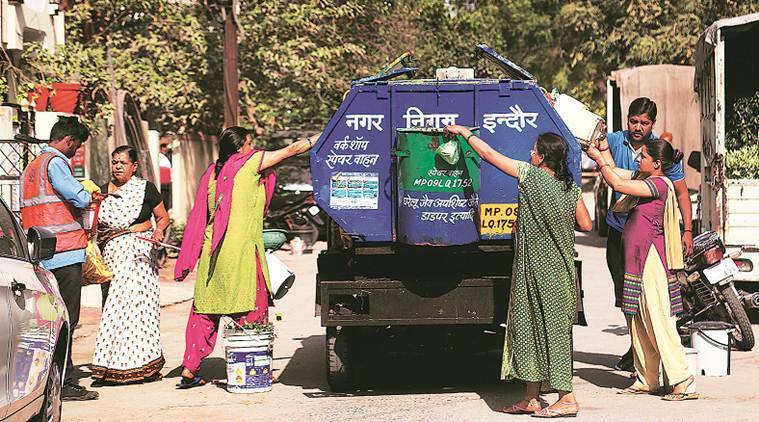 “We use 10,000 litres of water every night to wash roads, railings,” says Asit Chaudhury, general manager of International Waste Management Pvt Ltd, a firm that has been contracted to keep Indore’s roads clean. The Kuwait-based company has specifically moved Chaudhury to the city for this project. As he walks along a road, he points to a Rs 3.5 crore road-sweeper machine, its three steel brushes sucking dust and polishing the road. Such machines have been imported from the US, Sweden and Italy. In 2016, when the IMC launched these machines, 800 dumpers were required to carry the dust. Last year, the number came down to 35. Following Indore’s example, Jabalpur recently procured the machines. But with summers on, the IMC may have to rethink its use of water to wash the city. Already, complaints of water shortage have been pouring in from the city’s southern parts. On the morning of March 7, after Indore bagged the cleanest city title for the third year under Swachh Survekshan, Ajay Bherve, 23, was presented with a garland by the residents of Sukhlia colony, north of Indore, where he did his daily rounds of collecting garbage. Two years ago, his mother, a sweeper, had forced him to take up the job of a garbage collector with IMC. “Initially, I thought why should I pick up waste. Even the salary isn’t great,” Bherve says, pointing to bungalows where residents earlier did not segregate waste. As the Swachh Bharat song plays from his van, Bherve balances himself by holding a rod that runs along the vehicle. Residents step out, and some women throw diapers and sanitary napkins in the hazardous waste compartment.